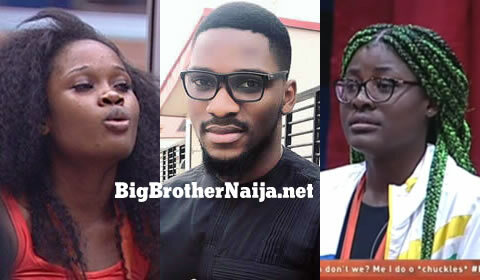 11:27pm – Big Brother summons Head of House Tobi to the diary room. 10:48pm – Bambam is evicted from the Big Brother Naija house. 10:30pm – The party has now ended, Ebuka has now entered the House with the Housemates. 9:00pm – This week’s Saturday night party kicks off and all our housemates are very smart. 3:46pm – Khloe enters Teddy A and Bambam’s bed and tells Bambam that they’re going to share Teddy A. 3:43pm – Khloe, Lolu and Rico Swavey are in the closet room having a conversation. 3:39pm – Big Brother orders the housemates to FREEZE. 2:20pm – The guys are in the kitchen preparing their meal. 1:50pm – The ladies are in the lounge having a conversation as Nina gives Khloe a hairdo. 1:46pm – Some housemates are having their first meal of the day. 1:34pm – Nina is washing dishes. 1:07pm – Cee-C is in the kitchen cooking. 12:30pm – Rico is giving Anto a hairdo in the lounge. 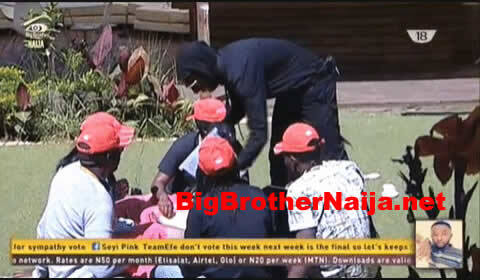 11:48am – Teddy A and Bambam are in the garden conversing. 11:34am – Alex is playfully waking up her fellow housemates who are still in bed. 11:03am – The ladies have began waking up. 9:00am – Housemates are still sleeping. Good morning to you all and welcome to day 62 of Big Brother Nigeria 2018, follow today’s Live Feed Blog for all the latest updates. You can as well check out yesterday’s highlights Here. Previous story Who’s Your Favourite Male Housemate Of BBNaija 2018?